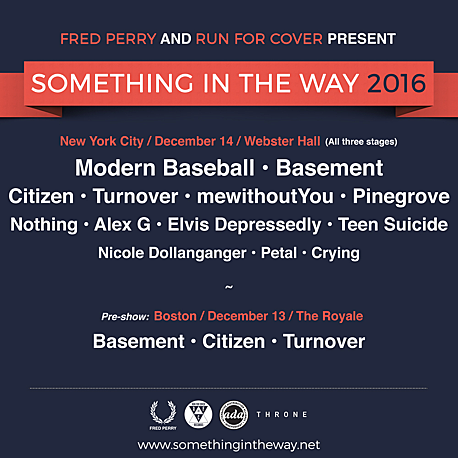 The full lineup for Run For Cover Records and Fred Perry’s Something In The Way festival is finally here. The last two reveals are Pinegrove and Petal, who both just opened for Kevin Devine at Irving Plaza last night (stay tuned for pics). The fest happens at NYC’s Webster Hall on December 14 and the rest of the lineup is Modern Baseball, mewithoutYou, Nothing, Citizen, Turnover, Basement, Alex G, Crying, Teen Suicide, Elvis Depressedly and Nicole Dollanganger. Tickets are still available and we’re also giving away a pair. Leave a comment below or tweet “hoping to win tickets to @rfcrecords fest at @WebsterHall from @brooklynvegan http://bit.ly/2gpoGBG” for a chance to win.